Mario Guerrero has suddenly begun to look a little old. He is no longer a guy who could be mistaken as a promising youngster. The dissolving of the faint aura of potential around Mario Guerrero strikes me as the flip side of the solidity he gained by carving out a niche for himself as a decent utility infielder. He chose a path and made his way down the path as best he could. The years have gone by and now here he is, a veteran bench guy, no more, no less. I am several years older than Mario Guerrero was at the time of this picture, but I still find myself trying with all my meager might to hold onto some sense that my life is yet to come, that I still have some yet unrealized potential. If I had a baseball card, it wouldn’t have much on the back. A remote birth date, height and weight suggesting the expanding midsection of middle age, a birthplace unrelated to the listed residence, a space-filling cartoon with a caption reading “Josh wants to be a writer some day.” The years reserved for my official record would be blank. I’ve mostly avoided an actual life, always hoping for some impossible call-up to the big leagues and instant all-star status. The picture on the front of the card would show a 38-year-old guy who has never really gotten his hands dirty with life, never really thrown himself fully into anything, never really chosen a path, a look on his face like a few seconds and rigid steps earlier he’d set off the hidden security system alarm at the front of a mall store. Even though he’s guilty of swiping something small and juvenile–a chocolate bar, a pack of baseball cards–it appears he might not be apprehended, he might get away free this time, once again, but he’s not quite sure. He’s still bracing for the clap of a hand on his shoulder. 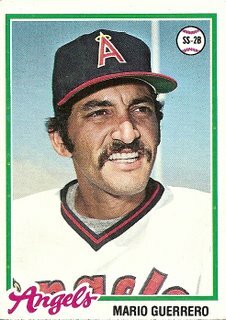 Anyway, I don’t know why Mario Guerrero is shown as an Angel in this 1978 card. In December of 1977 he left the Angels to sign as a free agent with the San Francisco Giants. If Mario Guerrero felt good to be in control, for once, of yet another changing of teams, the feeling must not have lasted very long. Before he reported to spring training for his new team, the Giants sent Gary Alexander, Gary Thomasson, Dave Heaverlo, Alan Wirth, John Henry Johnson, Phil Huffman, and $300,000 (which at the time was a fairly prodigious sum of money to be thrown into a deal already including several players) to the Oakland A’s for ace pitcher Vida Blue. As you will notice, Mario Guerrero’s name is not listed in the battalion dispatched to fetch Vida Blue, but the Giants did agree to include in the deal a promise to also send the A’s a player to be named later. Certainly Mario Guerrero must have been particularly attuned to the possibility of intimate change suggested by the addition of this clause. Having been a player to be named later and also traded twice in part or in whole for a player to be named later, Mario Guerrero surely sensed that his life might once again be about to change. I guess everybody’s bracing for the clap of a hand on their shoulder, one way or another. On April 7, 1978, the Giants completed the Vida Blue deal by adding Mario Guerrero to the pile of bodies they’d already shipped across the bay to Oakland. I don’t know what Mario Guerrero’s expression was when informed of this deal. I doubt he was smiling, as he is here, but if the numbers he put up after the deal are any indication, the tough, weathered resolve beneath this smile remained: in 1978, Mario Guerrero posted career highs in games, at bats, runs, hits, doubles, triples, home runs, and RBI. 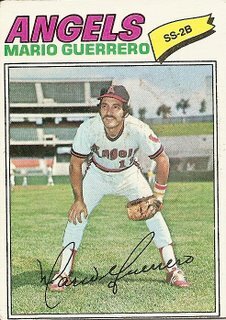 This 1977 card signals the passing of the halfway point of both my childhood and Mario Guerrero’s itinerant career. Early in the preceding season, Mario Guerrero was traded by the St. Louis Cardinals to the California Angels for a minor leaguer named Ed Jordan and a player to be named later. The player to be named later turned out to be another minor leaguer named Ed Kurpiel. So by the time he posed for this picture, Mario Guerrero had been a player to be named later, had been traded for a player to be named later ultimately named Willoughby, and had been traded for two minor leaguers, one named Ed right at the start, the other also named Ed, but later. Still, Mario Guerrero seems happy and hopeful here. This makes sense, in a way. Despite his constant involvement in trades seemingly designed to highlight his insignificance, he had proven himself to be a useful major leaguer, averaging well over 200 at bats a year while playing ably at second base and shortstop, arguably the two most important defensive positions on the field. He had, in fact, just completed his best season to date, leading the anemic, league-worst offense of the Angels in batting average with an admirable .284 mark while also somehow swatting his first major league home run. This hopeful card first lit up my collection right in the middle of my years in the hippie multiage class I mentioned in the last post. When writing of that class I often resort to cheap satire, probably due to a lack of imagination. But the truth is I mostly loved that class, especially the middle years, the Mario Guerrero as an Angel years. All day long, more or less, I was encouraged to make up stories. It occurs to me now that most if not all of the stories–told in the form of comic books, scrolls made to unfurl inside television-like cardboard boxes, animated movies of crash-marred car races, theatrical sequels to Star Wars featuring light sabers made of colored plastic sheets and flashlights, even my autobiography–were about wisecracking ectomorphs surviving disaster. The prototype for all these stories was an early crudely rendered serial drama about a character named Ribad the Rabbit, who was constantly having trees fall on him and other woodland creatures open fire in his direction with automatic weaponry as he tried to go about his day. Why me? asked Ribad the Rabbit again and again. There was never an answer, but on he went, inexplicably indestructable. You are currently browsing the archives for the Mario Guerrero (Cal.) category.